All students or iPhoneDevCamp.nl alumni who join us at iPhoneDevCamp Amsterdam on the 25th may attend iCE Amsterdam for 75.00€, incl. VAT (a discount of 470.00€). In addition, all qualifying registrants will receive a free copy of 140 Characters: A Style Guide for the Short Form with their purchase. Simply comment here or email the organizers to identify yourself. Update: Check out this video of me explaining the book 140 Characters, entertaining because I confuse a metonym with a charactonym. Special Event with author of 140 Characters. The Biznik Innovators Series connects independent business people with some of the most premier innovative thought leaders published today in a swank downtown venue (with complimentary wine). When the authors visit Seattle, we find innovative ways to celebrate their books, while providing you with a unique networking opportunity. The engaging Warren Etheredge, of The Warren Report, will lead an intimate and entertaining on-stage conversation with the author that takes the entire event up a notch. Before and after networking with the author and other guests in an intimate setting at the elegant Pan Pacific Hotel. AND in addition to the wine & appetizers, a copy of the book, signed for you by the author after the interview, is included in the ticket cost. VIEW VIDEO (1:33) about the Innovators Series. Special thanks to Kim Ricketts for her organizational powers. I’ll see you in Seattle! Review copies have shipped, and now 140 Characters: A Style Guide for the Short Form will be appearing in stores across the US and Canada. Look for it, snap a picture, and post it here! Once you’ve read it, please post a review to Amazon, Borders, or Barnes & Noble. Don’t forget: in one week I’ll be speaking in San Francisco and signing books. Meanwhile, enjoy a wonderful review of the book from Tucker Bradford. San Francisco, CA – Twitter – the 140 character online service that allows users to share, discover and connect with anyone, anywhere in the world – has abruptly swept the globe, taking many by surprise. Business owners, celebrities and regular Joe’s alike have unabashedly criticized or made fun of the medium, rather than fully understanding its purpose, potential, and power. 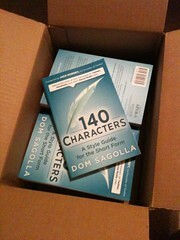 With 140 CHARACTERS, Sagolla shares the way to develop a personal voice and make the most of your messages. 140 CHARACTERS aims to do for Twitter and other social networking sites what Strunk & White’s The Elements of Style did for good writing via lessons in grammar and composition. “The talkative habits of e-mail and superfluous chatter will be replaced by poetry and one-liners, the haiku and the hyperlink,” predicts Sagolla. In a world of three second attention spans, the short form is not just confined to Twitter, but also Facebook, LinkedIn, and text messaging. One will have to learn to say more with less: if there is a smaller word that means the same thing, use it. If there is a link to a reference, shorten it. “Wherever possible, use fewer words,” explains Sagolla. “This is harder than it sounds, but once you get past the basics of grammar you start getting into the really interesting aspects of poetry and word design.” Most of the advice in 140 CHARACTERS is focused on helping the reader to find the right words. A handbook for an emerging class of writers and journalists, this book is written to include readers in the evolution of Twitter and the short format. The print and digital download is accompanied by an interactive Hypertext Edition for iPhone, published by Sagolla’s company DollarApp. See 140characters.com or twitter.com/thebook for details. 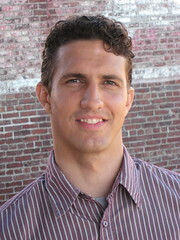 Dom Sagolla (San Francisco, CA) helped create Twitter.com. After attending Swarthmore College, he worked as a software engineer in Silicon Valley during the dot-com boom. Dom earned his Masters in Education from Harvard University in 2000. Since then he has helped engineer Macromedia Studio, Odeo and Twitter, Adobe Creative Suite, and now produces iPhone software with his company DollarApp in San Francisco. 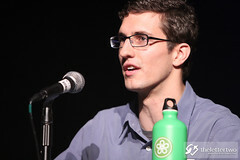 His successes include the official Obama ’08 iPhone App, as well as two iTunes Staff Favorites: Big Words, and Math Cards. @Dom has over 9,200 followers on Twitter as of September 2009, and manages more than 25 other brands. For the convenience of your readers, please include the following in your review: Wiley books are available at your local bookstore or by calling 1-800-225-5945. I’m pleased to announce that I will be appearing at the Swarthmore College Science Center (near Philadelphia) for a special event. The event will feature a brief address, a demonstration of the iPhone App, time to answer questions, and the signing of books. It’s been a dream of mine to do this since I graduated from Swarthmore with a degree in English Literature in 1996. Fellow speaker Monty Metzger used his Flip camera to capture a brief interview about the basics of the book, available October 19th. Note: I correct myself, but the book contract was in fact signed in late June. I did leave Adobe to work on it full time in July and submitted the first draft on August 3rd. This pattern complies with the DollarApp strategy of: 1 person, 1 month, 1 feature. My speech at FITC Mobile was about the “one-dollar-app opportunity”. Although I currently have one dollar’s worth of app with the Hypertext Edition, I believe I’ll continue adding value and ship it for a bit more than a dollar. More news to come. Today begins my first book tour, starting with a trip to Canada for a presentation on the Hypertext Edition. Want to add your city to this list? Please contact press@140characters.com. I’m excited to be speaking at 140 | The Twitter Conference in Los Angeles, alongside Veronica Belmont and Dave Peck. This follows the previous 140 | The Twitter Conference, in which I spoke alongside Britt and Loren. It was a great time in Mountain View, and it’ll be wonderful in LA as well. I may even have advance copies of 140 Characters on hand by then. You’re the proud owner of an iPhone application in the App Store — or soon to be. Now what? How will people know about your app? Join us for the second networking session of The iPhone Network Lounge @PariSoMa and find out how you can effectively spread the word about your application. 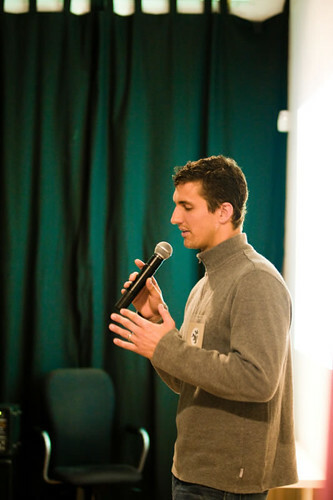 Guest speaker Dom Sagolla will describe the power of social media and how to best use it to market an iPhone application. This is a free networking event for iPhone lovers, including techies, non-techies and business minded. Refreshments will be served and we invite contributions to help provide plenty for everyone. The event is organized by Bamboudesign and hosted by PariSoMa Coworking Space in San Francisco. Marketing your app is usually a second thought to most developers and designers, but it takes a community of people to market an app using social media. 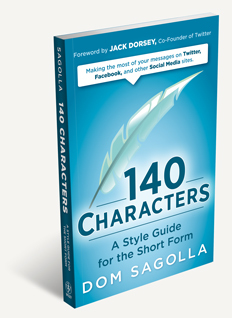 As a co-creator of Twitter, and author of the upcoming book “140 Characters: A Style Guide for the Short Form“, Dom Sagolla will describe a unique approach to marketing software. The story of @TheBook and @BookApp is a tale of Twitter and social media success that trails two iTunes Staff Favorites: iPhone apps Big Words and Math Cards. 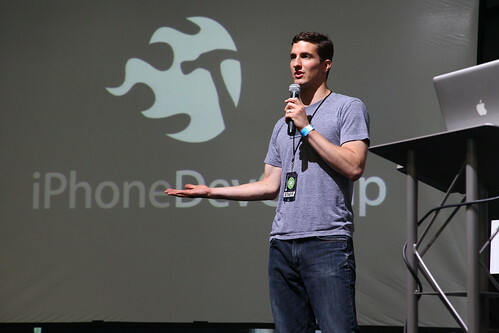 Drawing upon experience helping to create the Obama ’08 iPhone App last year, Dom will share how his company DollarApp is the simplest model for building a business one app at a time. Bamboudesign is the creator of the iPhone Network Lounge. Bamboudesign is a San Francisco-based company that designs and develops mobile applications and websites, in particular for the iPhone. Using a human-centered design methodology, combined with an expertise in natural (touch) user interface design, the company delivers products that meet usability, effectiveness and aesthetic standards. http://www.bamboudesi…. PariSoMa is a coworking space in San Francisco that provides desks, wifi and coffee to independents and startups. Our goal is to work as a platform for communities to foster innovation, collaboration and collective intelligence.http://www.parisoma.c….